SANAA, Yemen — Yemen’s Shiite rebels said Monday that they will halt rocket fire into Saudi Arabia for the sake of peace efforts, answering a key Saudi demand in the latest push to stop the civil war in the Arab world’s poorest country. But the rebels also said they had fired a ballistic missile into Saudi Arabia overnight in response to an attempted border incursion and a Saudi airstrike, and that they reserved the right to respond to attacks. For the past three years, a U.S.-backed, Saudi-led coalition has been waging war against the Iran-aligned rebels, known as Houthis, to restore Yemen’s internationally recognized government. The rebels say they have long been excluded from that government and aim to rectify historic grievances. Rebel leader Mohammed Ali al-Houthi announced in a statement that the rebels had ordered the cessation of rocket and drone attacks on the Saudis and forces loyal to the United Arab Emirates, a leading coalition member, at the request of U.N. envoy Martin Griffiths. “We are ready to freeze and stop military operations on all fronts in order to achieve peace,” al-Houthi said. He mentioned the rockets specifically as part of a longer statement in which he blamed the United States for being the main driver behind “the aggression” against Yemen. 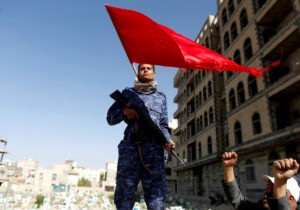 The Houthis swept down from northern Yemen in 2014 and captured the capital, Sanaa, with the help of forces loyal to longtime strongman Ali Abdullah Saleh, who had been forced from power by an Arab Spring-inspired popular uprising. Saleh was killed in internal fighting between the Houthis and their allies last year. The government fled Sanaa in early 2015, and Saudi Arabia, citing fears that its nemesis Iran was trying to make inroads on the Arabian Peninsula, began launching airstrikes against the rebels in March of that year. Riyadh formed a coalition of Sunni Arab states, including the UAE, Kuwait, Egypt and Sudan, and launched ground assaults on several fronts but failed to take the capital. After major setbacks, including the death of some elite officers, it outsourced the ground fighting to local troops, including a group trained by the UAE in the south. It was not immediately clear to what extent the Houthi move to stop missile fire into the kingdom would halt the overall violence. While the guns have gone silent inside central Hodeida, fighting continues on its outskirts and elsewhere in the country, and several previous peace initiatives have failed. International outrage over the killing of journalist Jamal Khashoggi by Saudi agents in October focused attention on the war in Yemen, leading the U.S. to scale back its support for the coalition and call for a cease-fire by the end of this month. But the U.S. call for a truce was immediately followed by a renewed coalition onslaught on Hodeida, with dozens of fighters and civilians killed on both sides. A week later, the stalemate resumed, with the Houthis still firmly dug in on the city’s outskirts. Rohan reported from Cairo. Associated Press writer Edith M. Lederer at the United Nations contributed.